I came across this recipe from allrecipes.com and have been using it ever since. My favorite part of this recipe is the crunchy and buttery topping. I reduce both white and brown sugar a tiny bit to suit my own preference. 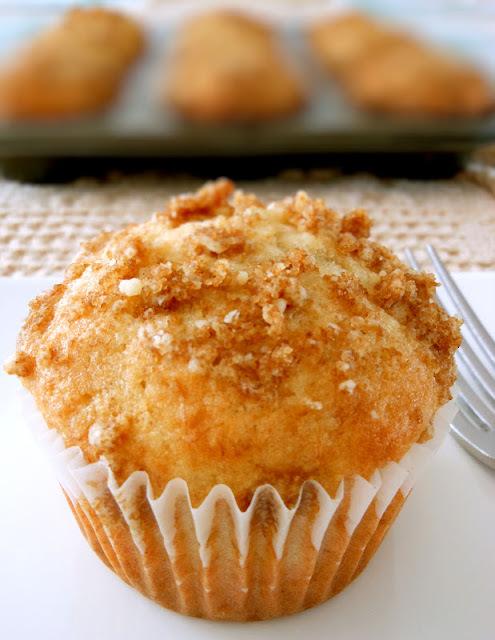 These banana crumb muffins surely make a great snack or afternoon tea for my family. Grease 10 - 12 muffin cups, or line with paper liners. Mix flour, baking powder, baking soda and salt together. In a mixing bowl, beat egg, sugar, mashed bananas and melted butter well. Add the flour mixture into the banana mixture. Continue beating until smooth. Fill muffin cups 2/3 full with batter. For the topping mixture, place brown sugar, flour, and cinnamon in a small bowl and mix well. Cut in butter until mixture resembles coarse meal. Sprinkle topping mixture over muffins. Bake for 18 to 20 minutes. Hi Evelyn!! How are you? I love your new look on your site! And these banana crumb muffins look so good. I should make these instead of banana bread one day. We've been eating all kinds of banana bread but it's time to make something different! Love the crumbs on top too! I am fine! Thank you Nami!